Serving the well-being of all life. 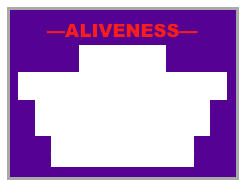 Inevitably, aliveness gets suppressed in all of us whether we are aware of it or not. We have the power to restore our innate aliveness and become more of who we really are—living with more meaning, joy, satisfaction and purpose; and having a positive impact on the future of humanity. 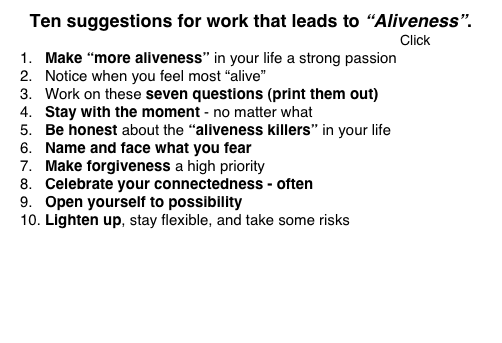 Make “aliveness” in your life a strong passion. A word of caution. Working on aliveness is not easy because we are so well socialized into a culture that suppresses who we really are–whole and powerful. Striving for aliveness won’t work because you can’t strive for and have aliveness at the same time. You can only work on specific things that lead to aliveness. That’s the idea behind the “7 questions for self-examination”— exploring the things that stand a good chance of restoring and expanding your innate aliveness. This shared celebration of aliveness expresses the power of community dedicated to make the world a better place.